In a human-machine study conducted by an MIT professor, it was shown that teams made of humans and robots collaborating efficiently can be more productive than teams made of either humans or robots alone. Universal Robots, the Danish manufacturer of a line of collaborative robots (also called "co-bots"), recently published financial statements which provide valuable insights into the growth potential of collaborative robots. At present, sales of collaborative robots represent just 5% of the overall robot market. The collaborative robotics sector, according to multiple pay-for research reports, is expected to increase roughly tenfold between 2015 and 2020, reaching over $1 billion from approximately $95 million in 2014. In financial statements released in February, Universal Robots (UR) reported 2015 revenue of $61.44 million, a 91% increase over 2014, and net profit of $9.6 million before taxes for the year, up 122% over 2014. Unit sales, which began in 2009, have risen at around 75% each year to 3,500 in 2015. At year's end, UR employed 150 in Denmark and another 50 worldwide, had 7,000 robots at work in the field, and had a global network of integrators and distributors totaling more than 200. Enrico Krog Iversen, UR's CEO, said he hopes that 2016 sales will exceed 90% and that UR had moved into larger space in 2014 to handle this level of growth. The new facility has a capacity of 33,000 units per year. At just 75% growth each year, as can be seen in the chart above, UR will hit their plant capacity by the end of 2019! "This acquisition complements our System and Wireless Test businesses while adding a powerful additional growth platform to Teradyne. Universal Robots is the technology and sales leader in the fast growing collaborative robot market and we are excited to have them join Teradyne." In regards to the acquisition, Iversen said that Teradyne was opening doors to their customers in the electronics industry which are prime prospects for UR co-bots. Regarding competition, Iversen said, "Our main competitor is manual labor." Stated another way, within the SME community, a big holdup is educating managers, engineers and workers regarding the value, opportunity, employee performance improvement and quick ROI of deploying co-bots as worker assistants. As this educational process progresses and succeeds, co-bot sales will surely follow. As ambitious as UR's fast growth figures and forecasted future sales are, they represent just one co-bot competitor serving millions of SMEs. 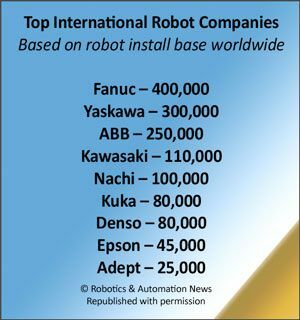 They don't reflect what the Top 8 robot companies - Fanuc, Yaskawa, ABB, Kawasaki, Nachi, Kuka, Denso, Epson and Adept - have in store. Because each of these companies is publicly held, they are limited in what they can say about the future and don't provide any information about their plans relating to the introduction and marketing of their brand of co-bots. We do know that ABB has a two-armed robot named YuMi (some of which are installed at various Mercedes Benz factories) and a one-armed as-yet unnamed robot which they acquired from gomTec that will be rebranded and launched later this year; Fanuc recently introduced a heavy-lifting co-bot; Kuka has an elegant lightweight but very expensive co-bot; and each of the other vendors (except Yaskawa), have begun to offer various co-bots. Consequently the unit sales forecast in the chart above doesn't reflect any effect from the Top 8 companies. Other co-bots - particularly those that add mobility to their capabilities - are creating new markets for guides, kiosks, store assistants, inventory takers, warehouse and distribution center "gofors", and countless other applications including mobile personal assistants such as the SoftBank Pepper robot. Many pay-for research reports suggest that these types of co-bots will grow at around 30% annually - a far cry from UR's growth these past few years - but substantial nonetheless. The SoftBank Robotics Group is producing 1,000 Pepper robots every month and plans to double that number when they begin sales later this year into China. The European robotics initiative for strengthening the competitiveness of SMEs in manufacturing, called SME Robot, was funded by the EU FP6 (Framework Programme 6) and started in March, 2005 (and extended in a successor project in FP7 to June of this year). It was chartered to determine ways to keep labor from being sent offshore to lower labor-cost countries and focused on the large number of small and medium-sized enterprises (SMEs) at threat of offshoring. [SMEs are defined as manufacturing companies having less than 500 employees. The number of SMEs worldwide is estimated to be 6 million.] The thesis was that if you empowered SME employees with robotic tools, the SME company would become more cost efficient and competitive and therefore not have to be off-shored. Thus the initial marketplace for co-bots was to SMEs. In a parallel development in America beginning in 2008, Rodney Brooks founded Rethink Robotics and began educating American SMEs about the benefits of the Baxter line of robots he was developing. It’s rare that one man can influence a whole universe of stakeholders. But from his network of MIT students and extensive speaking engagements to his various entrepreneurial activities, he has informed and charmed his vision of what robots can do and how people and corporations can benefit. Timing, of course, played a role as have the rapid changes and lowered costs of new sensors and robotic technologies. But throughout, Rod Brooks has defined the need and sold the sizzle of collaborative robots. At first, his product, the Baxter robot, wasn’t able to fulfill his promises. Universal Robots’ robots, however, did – and their sales took off while Baxter’s stayed minimal. Last year Rethink did a major software upgrade and added a new one-armed robot called Sawyer. Reviews have been favorable for both changes and it appears that Rethink has finally become a real competitor in the co-bots marketplace. (See below for more about Rethink). BMW, which utilizes ~7,500 industrial robots in their factories around the world experimented with UR co-bots last year with significant results. In a human-machine study conducted by an MIT professor, it was shown that teams made of humans and robots collaborating efficiently can be more productive than teams made of either humans or robots alone. They also found that they could increase productivity and also reduce ergonomically challenging tasks done by humans which increased morale and empowered workers with these easily programmed collaborative robots. A BMW spokesman said that, based on the success of these tests, he could foresee doubling or even tripling the number of robots in BMW factories. When I asked UR's Iversen whether he had received a multi-thousand purchase order from BMW subsequent to their tests, he playfully responded by saying, "BMW is a strong partner." Again, in a parallel development at a Mercedes Benz factory in Germany, in an effort to halve the 61 hours it takes to produce a car, Mercedes is shifting to what it calls “robot farming” - equipping workers with an array of smaller, lighter machines and co-bots. Customization is key to Mercedes' marketing and buyers are choosing an ever-increasing array of options causing a need for flexibility not presently available from legacy robots. Humans (and their co-bots) are being added to provide that needed flexibility. While robots won’t completely disappear, they’ll increasingly be smaller and more flexible and operate in conjunction with human workers rather than be off working behind safety fences. Rethink has recently been developing an international distribution and integrator network for it's Baxter and Sawyer robots. Along with Sumitomo Corp for Japan and Shanghai Electric for Eastern China, Rethink is working with startup Hunan Cothink Robotics Technology for Northern and Southern China. Cothink will have a capability to integrate, test and install up to 2,000 robots annually. Asia, and particularly China, are integral to Rethink Robotics global expansion plan. "Chinese manufacturers are facing similar challenges to their counterparts around the world, including rising wages and labor shortages," said Scott Eckert, president and CEO of Rethink. "In order to stay competitive in a global manufacturing economy, these companies are looking at collaborative robots to help them become more efficient and responsive to customer demand.... Baxter and Sawyer are for sale in China now, with some units already deployed in a number of different customers. We have a lot of interest from electronics manufacturers as well as consumer products companies and the automotive supply chain." The list of mobile co-bot providers is much more extensive and includes (to mention just a few) companies like Amazon, Fetch, Grey Orange, Harvest Automation, MetraLabs, and many others. These companies, and their primary applications, will be the subject of a future article. There's no doubt that the collaborative robot marketplace will be growing exponentially over the next few years - with UR leading the pack - and price, safety, flexibility and ease of programming being the key determinents as to which vendor(s) are chosen.